I am pleased to announce the release of the Out Of Silence CD compilation, containing my track "Snowblind and Falling". This double disk set is the work of Wolfgang Peter Menzel, who compiled the fifteen sonic interpretations of Samuel Beckett's work. There is a great deal of variety on hand over the ninety-nine minutes. Head on over to Spanish net label modisti to read more and have a listen. If you like what you hear, please place an order to support the sonic arts! 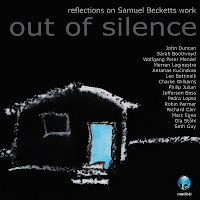 My contribution dates back to the Beckett centenary in 2006, when I designed a soundscape for a dramatic reading of his poetry. This was staged at Impact Theatre by the Fourfront Poets as part of the Cuisle International Poetry Festival (more info). My contribution was suitably minimal, and involved designing signature wind sounds for each reader. Diffusing these live, I transformed one to the next as the readings proceeded around the circle. Taking that experience as a starting point, "Snowblind and Falling" examines the textures of my own voice and verse in homage to Beckett. It forms part of a renewed engagement with voice that dates back to my earliest radiophonic works. I anticipated that this piece might work particularly well in context. Now that I've had a chance to hear the finished assemblage I am happy to call the piece a success!